The heterostracans, a large group of some 300 species, radiated extensively in the Silurian and Early Devonian. 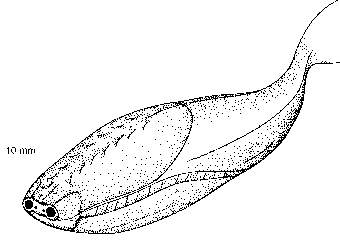 Their head shields vary tremendously in shape among different species, and they are distinguished from the astraspids and arandaspids by having a single exhalant opening on each side into which the gills open. Heteros-tracans all have in common a broad ornamented plate on top, one or more plates on either side of this, and a large element covering the underside (Halstead, 1973; Blieck, 1984). Heterostracans are grouped in a clade with Astraspida and Arandaspida, the Pteraspidomor-phi, as all share the synapomorphy of aspidin on their dermal armour plates (Donoghue et al., 2000; see Box 3.1). Sacabambaspis, and they bear an ornament of narrow parallel ridges. The body portion is covered with large bony scales that overlap backwards like the slates on the roof of a house. There is no sign of fins or paddles, so heterostracans must have swum by moving their tails from side to side, a rather clumsy mode of locomotion because of the weight of the armour and the inability to adjust the direction of movement. The amphiaspids show complete fusion of the head shield along the sides to form a single carapace, and the eyes are reduced. It has been suggested that the amphi-aspids lived partially buried in the mud where sight was not required: some forms, such as Eglonaspis (Figure 3.8(b)), have a long tube at the front of the carapace with the mouth opening at the end, possibly used as a kind of'snorkel'when burrowing. The pteraspids of the Early and Mid-Devonian are much better known, with more than 25 genera, which show considerable variation in the shape of the head shield. 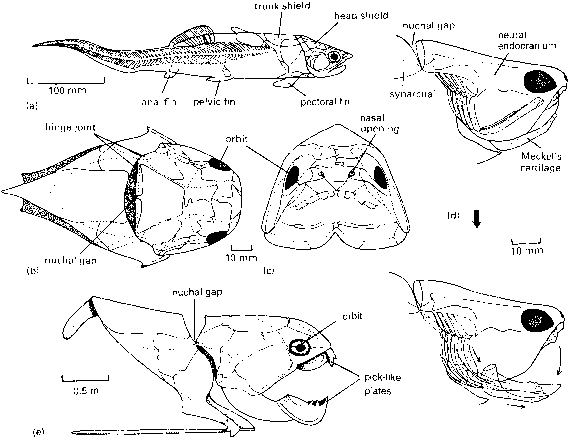 In Errivaspis (Figure 3.8(c)) there are large dorsal and ventral plates, the linking branchial plate, as well as a cornual plate at the side, an orbital plate around the eye, a rostral plate forming a pointed 'snout', several small plates around the mouth, and a dorsal spine pointing backwards. The rest of the body is covered with small scales that look more like modern fish scales than the bony plates of earlier forms. The tail is fan-shaped. The psammosteids are much larger than other het-erostracans, sometimes 1.5 m in width, and they are flat (Figure 3.8(d)). They have several rows of small scale-plates called tesserae lying between the main shields. The flattening of the body has pushed the eyes well apart and turned the mouth upwards. Drepanaspis looks like an 'exploded' pteraspid—all the major plates are the same, but they have moved apart. Feeding in heterostracans has been controversial: did they snap up largish prey items, or did they plough through the sea-bed mud? Heterostracans have numerous overlapping bony oral plates in the base of the mouth, but these do not show wear at the tips, so they could not have been used for ploughing. The oral plates are also covered with tiny pointed denticles that point outwards, and this would prevent larger food particles entering the mouth. Purnell (2002) suggests that most heterostracans swam above the sea-bed, taking in small prey items floating or swimming in the water.